Does your dog snarl and lunge at the end of the leash at the sight of another dog? Do you cringe at the idea of going in public with your dog let alone an off-leash dog park? Reactive Rover Rehab will provide you with the tools to help your dog overcome his limitations. Private sessions are designed to ensure safety and success and to meet the individual needs of you and your dog. You will learn canine body language, proper handling skills, attention and refocusing exercises and desensitization and counter-conditioning techniques. A sufficient level of basic obedience skill is required prior to beginning Rehab. Thank you for the wonderful improvement that we have seen in WATSON over the past 3 months. The pictures at the dog park say it all – we would not have believed that Watson (left) would be lying next to Samson as calm as could be. His response to other dogs is much more controllable and his reactive distance has decreased at least by 75%. Your professionalism and willingness to custom tailor the conditioning and training program to our needs and Watson’s personality are what have made this such a success. Your written reports on his progress were a great tool to gauge how far we have come. We discovered It’s Your Dog Training when SNICKERS was a puppy and brought her through several levels of obedience class. We were very pleased with the improvements Snickers made under the guidance of Leslie so, when we noticed Snicker’s had become reactive to other dogs while on her walks, we got in touch again about Reactive Rover Rehab. This time we relied on Samson for Snicker’s rehabilitation. He was wonderful! 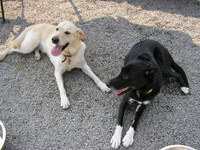 Snickers was immediately at ease with Samson – he was calm and confident and seemed to know that he was there to help. We were eventually able to introduce Snickers to the dog park environment where she now spends time romping and playing with the other dogs – mission accomplished!